Looking to become a newer, better you this year? Join the club. According to the University of Scranton, 45 percent of Americans make New Year’s resolutions regularly, with another 17 percent doing it occasionally. That’s a lot of promises to go for a 6 a.m. run, give up cupcakes or finally learn Italian. Plenty of businesses spend January thinking about how they can improve, too. And while cutting out carbs may not be at the top of your company’s to-do list, a lot of personal and business resolutions are based the same underlying goals: Spend time and resources wisely, squash bad habits, and build better relationships. Without the right support, however, all those good intentions are on the fast track to failure. The same University of Scranton research shows that only 8 percent of people who make resolutions accomplish what they set out to do. The takeaway? As you map out your company’s goals for 2016, start by identifying the tools you’ll need to be successful. 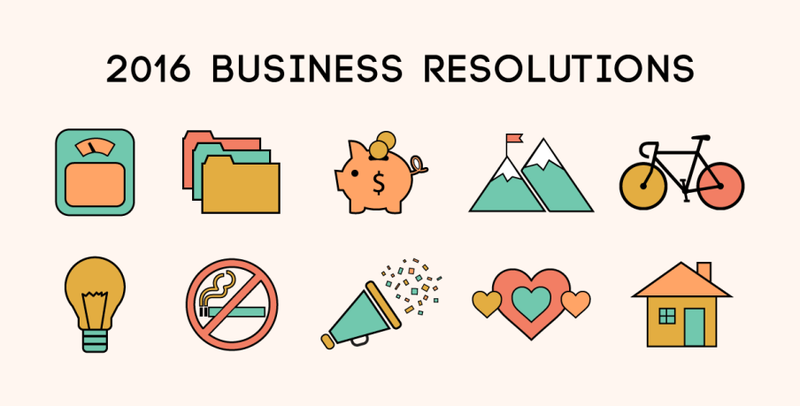 Here’s a look at the top 10 resolutions people make each year and the software that can help you make the same magic happen in your business. If you’re going to shed unwanted pounds, you need to know what’s in that sandwich you just ate for lunch. Likewise, accounting software helps businesses trim the flab from their operations by telling them exactly what’s going in and what’s coming out. Accounting platforms can automate invoicing and other processes, track expenses, and scale as your company grows – so you’re happy with the number you see when you step on your own scale. Are unmatched socks and decades-old T-shirts overflowing from your closet? It’s time to do some Kondo-ing and cut the clutter for good. For businesses, project management software brings much-needed order to your work by enabling team members to create project schedules, divvy up responsibilities and manage budgets. The result? Improved delivery times and ROI – and that’s sure to spark some joy. Those Starbucks runs and impulse Amazon purchases add up fast. Likewise, employee expenses can be a major and unpredictable expense for companies. Expense management software allows employees to input expenses by app or mobile browser, automates approvals, and provides reports organized by department or by project, so you can see where you need to tighten your belt. The holidays are over, summer’s far away, and we’re all yearning for a little excitement. Companies can make snoozeworthy meetings more fun than a round of Trivia Crack with gamification tools that recognize and reward employees for hitting their targets. Set up metrics for sales, customer service and other departments, and let the friendly competition take your business to the next level. Honest feedback from a trainer or workout buddy is a great motivator in the quest for fitness, whether you’re scolded for missing a run or praised for adding weight to your dead lift. Enterprise feedback management software gives businesses the same kind of push toward improved company health. Systemically gather data from customers and other stakeholders, analyze the results to find trends, and make adjustments accordingly to keep your company on its toes. The most interesting people (and the most successful employees) never stop learning. With training elearning software, you can create courses for onboarding, talent development or compliance training and integrate with performance management software — so you know who’s getting an A and who needs to stop by after class. To take on a tough resolution like giving up smoking, you need a strong support system. Likewise, when your company is poised to take on a challenging project or new initiative, it’s essential to have the right people on your team. Enter Core HR: This software can help you source, hire and onboard employees with ease, as well as automate management of various human resources functions, including time and attendance, PTO, and compliance. It’s better when we work together. With tools ranging from Web conferencing to online appointment management, collaboration and productivity software can help employees improve communication, generate more ideas, and organize information and projects more effectively. Enjoy greater efficiency and ROI, and feel the love grow on your team. Are you scouring Tinder every night for your next date? For businesses, figuring out which channel to use to find The One (or a lot of Ones) is daunting. Get top of mind and make a lasting impression with digital advertising. These platforms let you target your audience precisely, streamline cross-channel buying and gain more insight into the customer path to purchase – so you know just what Mr. or Ms. Right is thinking. Want to keep tabs on what the whole gang is doing? Just head to Facebook to hear all about your aunt’s latest vacation or Instagram to see your cousin’s new puppy. Staying in touch with everyone in your business’ network is a little trickier, which is why social media management software is key. Juggle multiple accounts on a single dashboard, schedule posts to go out automatically, and respond to customer inquiries across various platforms efficiently. You’ll stay in the know without missing a beat. No matter what you resolve to do this year, experts say breaking it up into manageable tasks instead of one large goal can make the process less scary and up your chances of success. A smart first step? Researching the tools that fit your company and its needs best.